Old feel, fresh vibe at the bars of Hobart's Salamanca Place. 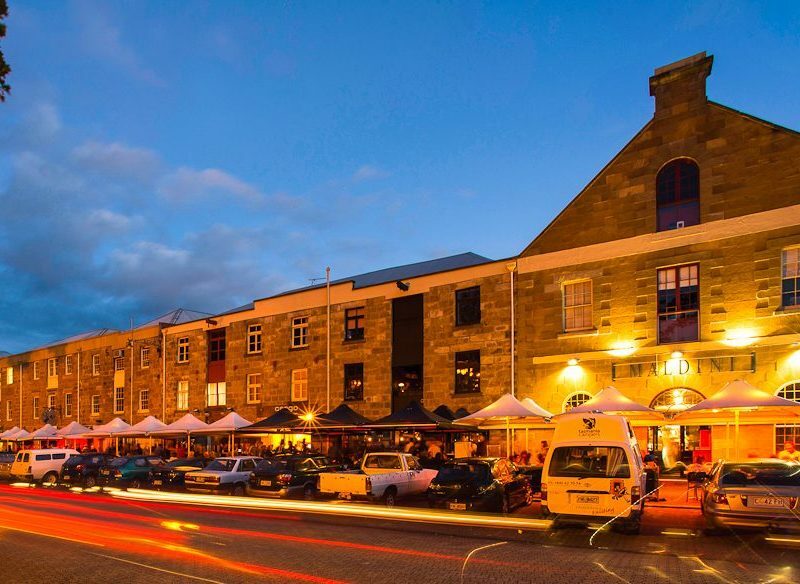 Elegant yet casual: Cargo Bar Salamanca Place, Hobart (photo: Kristie Hayden). If there is a dictionary definition of ‘arvo session’, Cargo Bar Pizza Lounge is it. In cold weather, snuggle in to leather lounges out back and sip on a Tassie red. Sunny days demand a table outside where southern sunshine warms backs while southern hospitality feeds the pumping crowd. A choice of 20 modishly-named cocktails (like the Raspberry Tart) keeps the whistle wet while waiting for the real treat; Pizzas as crispy as crostini. Toppings as fresh as the wind off the Derwent. The vibe: Elegant yet casual; an old bond and storage house with Georgian stone walls, heavy woods and dark floors lend an old world European feel. Grape does the grapes well, both local and international wines in the sandstone cellar (photo: Kristie Hayden). Revellers, pull up a retro bar stool indoors around the caged cork bar at Grape or settle under one of the heated canopies outside. The Sunday session is in order. Move to groovy jazz tunes from local musos under exposed-beamed ceilings fit for the set of Game Of Thrones. An impressive selection of Tasmanian, Australian and international wines nestle in racks against the sandstone walls creating a cellar-come-cave like atmosphere tempting the palate. Hungry: From the ever-evolving menu, slurp on Tasmanian oysters, munch on pork belly or fried chicken sliders or brave the crowd favourite, jalapeno and smoked cheddar croquettes. Jack Greene is all about craft beers, gourmet burgers and atmosphere (photo: Kristie Hayden). They say crowds flock for the craft beers and gourmet burgers at Jack Greene (and they’re good), but really this place is all about atmosphere. A sea of pendant lights hang from the ceiling like caged fireflies and hundreds of beer coasters and books pose as art-work on rafters and walls. Ascend from the dimly lit European-inspired tavern up the stairs to another room where a quieter atmosphere inspires conversation from big leather and velvet armchairs next to an open fire-place amid antique furniture with views of Salamanca. On a good night: Patrons cram around the marble bar placing orders while a bloke, neatly positioned under the stairs, plays guitar and expertly croons James Blunt and INXS to the growing crowd. Knopwoods Retreat was Salamanca Place’s first watering hole (hoto: Kristie Hayden). Retaining its old-English-style pub feel from the good old days when sailors, whalers and ‘fine’ women frequented, ‘Knoppies’ has a truly historic atmosphere and was actually the first watering hole in Salamanca. The sweeping curved nautical-inspired bar punctuated with vibrant leadlight windows holds up an old faithful contingent plus a steady flow of tourists. The new and the old: The first hotel to offer Guinness on tap (the toucan trophy on the wall proves it) and serving locally produced Gillespie’s alcoholic ginger beer plus 14 tap draught beers and a bloody mary menu, there are so many choices you’d be “bloody fussy” to not find something to your liking, well, that’s what the staff say anyway. Fancy a little taste of Japan in Hobart? You’ll be happy to stumble upon this treasure, if only for a unique range of Japanese craft beer on tap. Move from beer to wine and lounge amid sandstone walls and arches, absorbing two-hundred years of architecture and a glass of Bruny Island unwooded chardonnay. An award winning restaurant dishing up modern local cuisine and some of the best cocktail shakers in town render Quarry Salamanca the full package. Sweet potato beer? Manager Isabell says; “We want to push people out of their comfort zone with beer choices.” Such as Coedo Benaika Imperial Sweet Potato Amber which delivers on both name-length and punchy malty caramel-y taste.